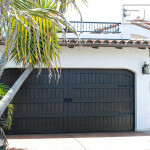 Spanish Colonial architecture is identified by its white-plastered walls and terracotta tiled roofs. 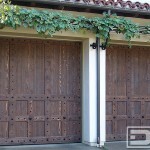 Iron forged balconies with hanging clay pots of luscious green plants with colorful flowers. Locals taking an evening stroll enjoying the views and colonial architecture while taking in the smell of the gourmet cooking and water-soaked earth smell coming from the freshly washed courtyards. 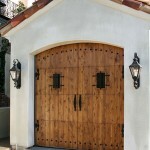 When designing a custom garage door in the Spanish Colonial Style we use elements such as decorative iron clavos, rustic woods such as Alder, Rough Cedar and other wood species that we distress to capture the glamour of the historic Spanish Colonial styles. 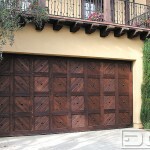 In order to accomplish an outstanding Spanish Colonial Garage Door, we first have to understand the culture and take in all senses of what Spanish Colonial Living really means. 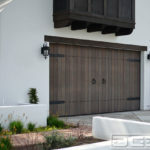 Understanding the history and lifestyle of yesteryear is the key to designing some of the most gorgeous Spanish Style Garage Doors in the world. 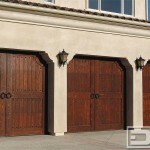 As the premier Spanish Garage Door manufacturer, Dynamic Garage Door's in-house designers have captured the old Spanish Colonial world through our discerning collection of high quality garage doors. 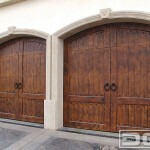 Travel ages past everyday as you drive up to your very own Colonial entrance at the push of a button. 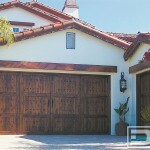 Escape the daily routine into your very own Spanish Colonial retreat starting the minute you drive into your garage in authentic architectural style. 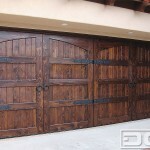 Without a doubt, the pride of owning your very own custom-designed Dynamic Garage Door will last for decades to come. 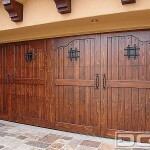 Because our door designers are experts in old world door design, rest-assured your custom garage doors will pass the test of time. 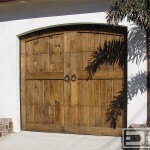 Browse our Spanish Colonial Garage Door photo gallery to view garage door ideas and designs that might work your home's existing architectural style or let our experienced designers create one for you.